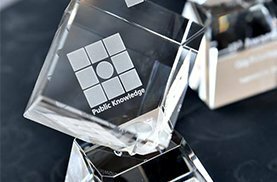 The Tech Institute's Distinguished Fellow Gigi Sohn was honored last night at Public Knowledge's annual IP3 Awards for her significant contributions in internet policy. Gigi was honored alongside Senator Ed Markey (D-Mass) and The Honorable Michelle Lee, who served as Head of the U.S. Patent & Trademark Office from 2013-2017. Gigi has worked for nearly 30 years as a public interest advocate, promoting competition and innovation policies to make broadband internet access more ubiquitous, competitive, affordable, open and protective of user privacy. She most recently served as Counselor the former Chairman of the Federal Communications Commission, Tom Wheeler, whom she advised on a range of issues relating to the internet, telecommunications and media. At the FCC, Gigi was described as "the conscience of the Chairman's office" for her work on behalf of American consumers and competition. She continues that work now, as one of the leading voices in the current policy debate over the FCC's proposed rulemaking to roll back net neutrality protections. She recently hosted a discussion on "The Battle to Save Net Neutrality" with Mr. Wheeler, Rep. Ro Khanna (D-Cal. ), television producers, telecommunications experts and the Executive Director of the Center for Media Justice. You can view the video here. Gigi's work at the Tech Institute is supported by a grant from the Ford Foundation, which has long worked to promote equal access to and fair regulation of the Internet to ensure transparency, privacy, access to knowledge, and free expression for all people. Gigi is also a fellow of the Open Society Foundations and a Mozilla Fellow. Public Knowledge is a non-profit public interest group that promotes freedom of expression, an open internet, and access to affordable communications tools and creative works. This was the Fourteenth Annual IP3 Awards Ceremony. You can learn more about the organization here. We're tremendously proud to have Gigi as part of the Georgetown Law community. Congratulations on the award!